What I love best about Gobble meals is that it takes only 15 minutes to cook a meal. And yet sometimes, I don’t have the wherewithal to spend a mere 15 minutes cooking. Saturday night was one such night. 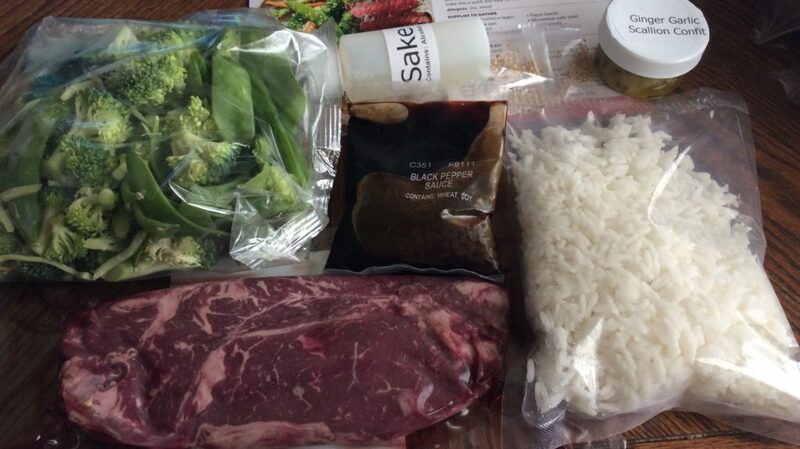 So I made the steak and microwaved the rice, and omitted the vegetable stir fry. The steak was good, the sauce was yummy on the rice. The rice was also very good (if Gobble fails, they should go into the business of selling refrigerated rice – they do an amazing job with it). It was a perfectly fine meal. 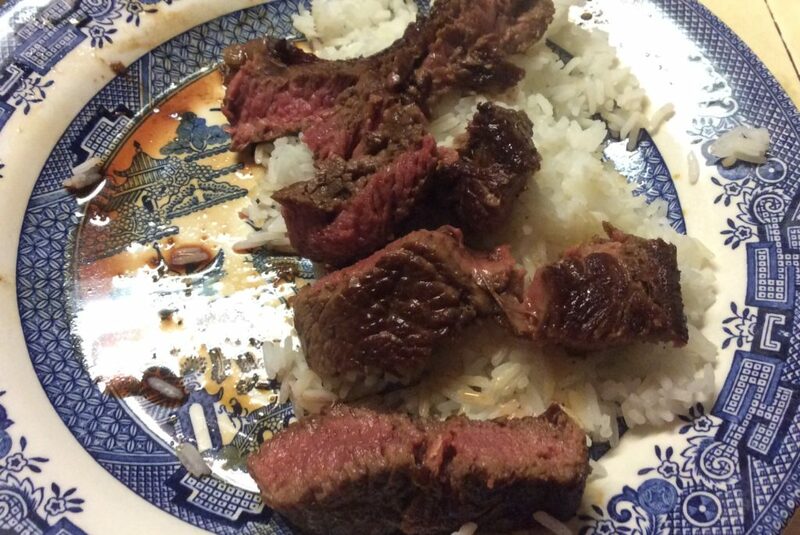 I was left hungry, even though I had the bigger half of the steak and most of the rice (my husband had gone with the kids to ice cream, so he wasn’t hungry), but that may be because I didn’t make the stir fry (though if I had, I’d still not have eaten it, as it’s not my type of thing). All in all, not my favorite Gobble meal, but acceptable. I think I paid around $14 for this kit with a “welcome back” promotion. I would not have been happy to pay full price ($26) for this. 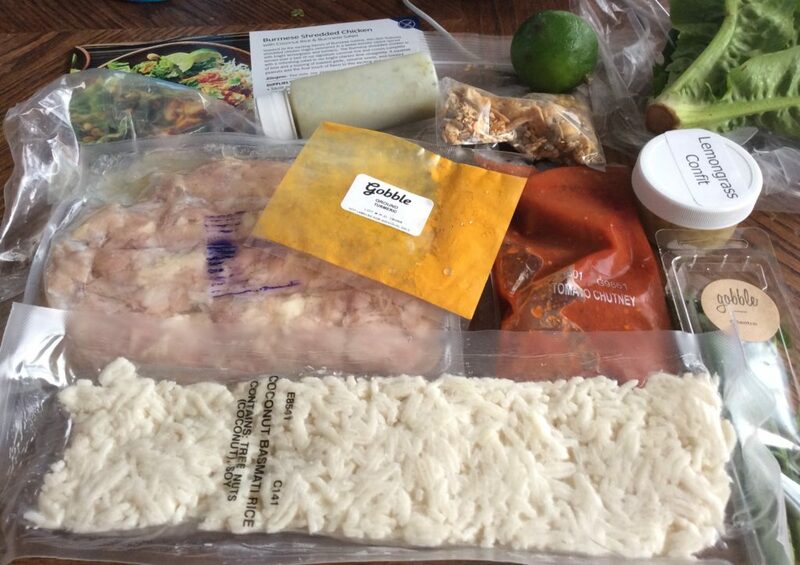 This Gobble kit for Burmese Shredded Chicken with Coconut Rice & Burmese Salad has to be my favorite (tasting) kit meal so far! It was tasty, scrumptious, exotic, not spicy, just satisfying. It had a great mix of textures, it hit all the right notes and combined perfectly. This very much was a ‘sum of its parts” meal – I would have been very happy with a meal like this at a restaurant. 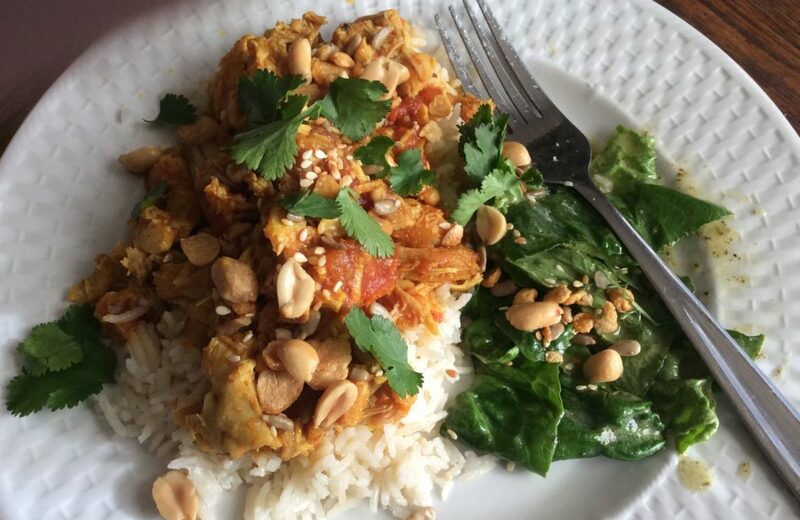 Even my super picky daughter liked it – she’d rate it 8/10! My only criticism is that I didn’t feel like I was actually cooking anything. The coconut rice was pre-cooked, the chicken was pre-cooked, the sauce and vinaigrette was pre-made. All I had to do is arm things up and put them all together. Obviously all necessary to get this meal on the table in 15 minutes, but still, something was missing. The taste, though, made up for it. Also, there was too little salad – about half as much lettuce as needed. I (think I) paid ~$14 for this kit or $7 per serving, with a promo good for one week. I found this frozen sandwich at Grocery Outlet for $2 and decided to give it a try. It was actually pretty tasty, though a little too heavy on the meats, which made it a bit salty for my taste. I microwaved it, so the panini was soft, but it was a pleasant doughy-chewy consistency. It’s not a huge bite, but it’s good for an easy snack. 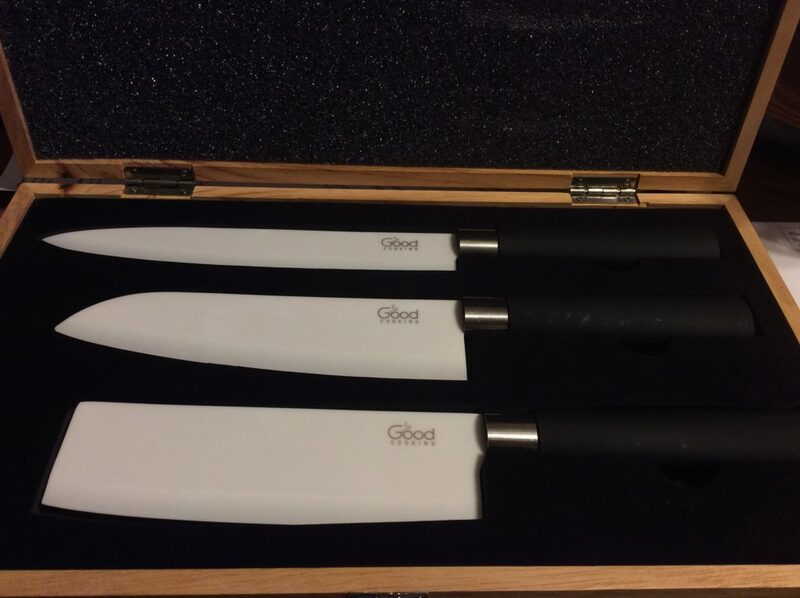 Yesterday, I was shopping at Grocery Outlet when I came upon a set of Good Cooking ceramic knives. I don’t have a smart phone so I couldn’t look at reviews for them, but at $30 for the set I figured they were cheap enough to take a chance on them. They were worth pretty much what I paid for them and no more. I’ve been using Kyocera ceramic knives for years, and I just love how sharp they are. Cutting vegetables or meats is a breeze with them. Plus I’ve never had to resharpen them. Unfortunately, a couple of years ago my trusted Kyocera “bread” knife broke while I was cutting some tough vegetable and later, it developed a chip. Mike got me a Kyocera set of knives for Christmas that year, and they were just as good as my previous one as far as sharpness went. But the chef’s knife in the set – the one I use most often – almost immediately developed a chip and then another, and then the tip broke off (when I was washing it, I think). I love using those knives – but they’re too expensive to be this disposable. 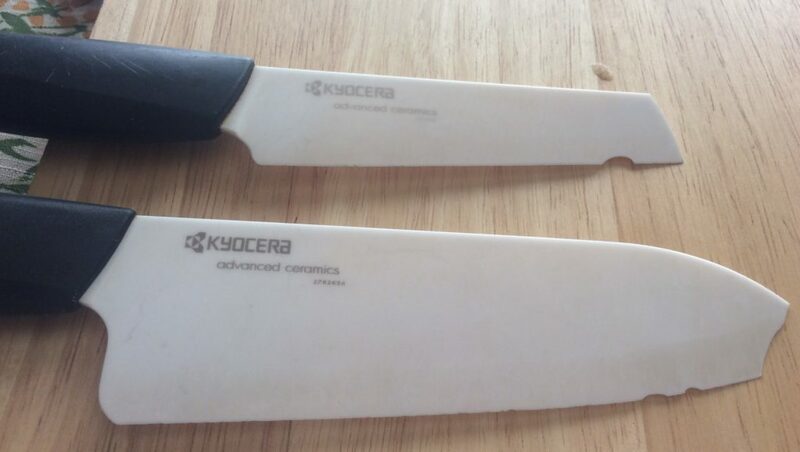 Kyocera presumably will replace knives damaged due to a manufacturer defect – but I’m not sure if being easily broken is a “defect” or a nature of the product. Amazon reviews of the knives are filled with photos of chipped knives. I wrote to Kyocera with photos of my knives, but have not yet heard back. Meanwhile, the Good Cooking knives are not nearly as sharp as the Kyocera. They work more like regular steel knives. This is likely because they are thicker than the Kyocera. I assume, for that reason, these knives will last longer – but only time will tell. Reviews online are not particularly encouraging. If anyone knows of a brand of ceramic knives that are both very sharp and don’t get easily broken, please comment below. My local Grocery Outlet store is currently currying a variety of Sky Valley bottled sauces. I picked up the Tikka Masala sauce because it’s vegan, and I’m always looking for stuff that my vegan daughter can eat. Unfortunately this was a bust. The sauce itself wasn’t bad. While I wouldn’t say it tastes like the tikka masala you can get at Indian restaurants, it’s better than anything I could make myself. Indeed, it tastes very much like Trader Joe’s masala sauce. They are both far more acidic and less sweet than your restaurant tikka masala sauce. The big problem for my vegan daughter was that the sauce was too spicy. She ate it with lots of rice, but still couldn’t get past the spice. Now, she doesn’t like spicy food, so in terms of level of spice I’d say this sauce is “medium” spicy. 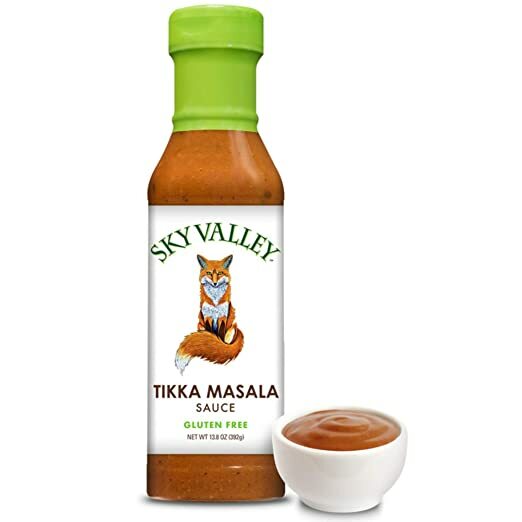 The 13.8 oz bottle of Sky Valley tikka masala sauce sells on their website for $5.30, but it was just $2 at Grocery Outlet and it was on sale for just $1.75 at Walmart (regular price $3.65). It’s produced in Danville (so not to far away from where I live) and exported all the way to the UAE! 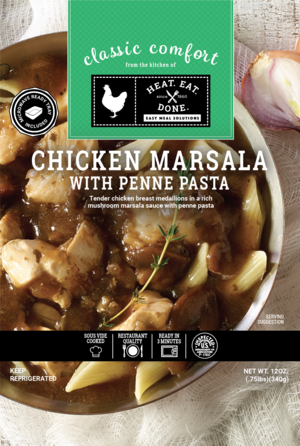 EveryPlate is a budget meal kit brand launched by HelloFresh, which has found it difficult to keep customers due to the relatively high price of their meals. It offers simpler meals than its parent company, with fewer fancy ingredients. It also only offers 5 choices a week, one of which is a ” premium” meal and costs $6 more per kit, which helps keep their prices low. 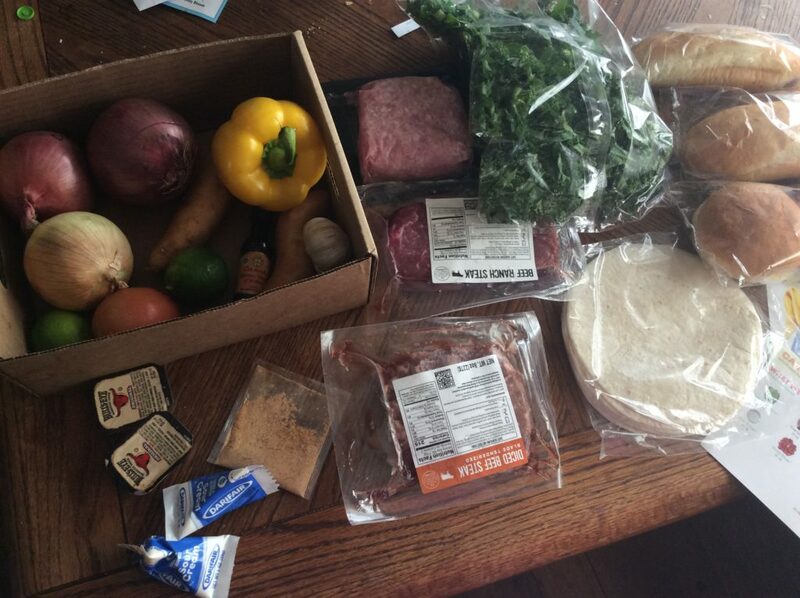 At $13 per 2-portion kit (including shipping costs), it’s considerably cheaper than HelloFresh’s $20 regular kits. But exactly because they have fewer ingredients, they are also easier and quicker to put together and cook. EveryPlate has two plans: 3 meals for 2 people per week for $30 + $9 shipping (so $39) and 3 meals for 4 people per week for $60 + $9 shipping. That means that for the 2-person plan, you get are paying $6.50 per person per meal – cheaper than other services, but not the $5 they advertise. Use this link to get $20 off your first box. EveryPlate’s reduced costs are achieved by offering fewer meal choices, each with fewer ingredients, reducing assembly time by not separating ingredients by recipe in the box and by not including some ingredients their recipes call for (e.g. butter & ketchup). EveryPlate offers four meal choices a week plus a premium choice that costs $3pp/$6 per kit more. The premium choice is usually steak. The meals are usually uncomplicated American favorites, things such as grilled cheese sandwich with tomato sauce, burgers, baked pastas and the now-popular “bowls”. Most meals include pork, chicken or sausages – there is rarely a vegetarian meal. For me, the lack of choices means that, despite its affordability, I couldn’t use this meal kit every week, as I seldom can find three meals out of the four they offer that at least two people in my house would like. The ingredients, in general, were of good quality. The meats were tasty and at least as good as supermarket meats. I particularly liked the ranch steak. The produce was hit and miss. I got a yellow onion instead of the green onion the recipe called for. The tomato didn’t arrive ripe – but it was fine two days later when I went to cook that recipe. The garlic and the limes were old, however. Fortunately, I was able to get a few good garlic cloves out of the garlic for the recipes that needed them, but neither lime could produce much juice. While some meal kits include all the ingredients you’ll need, save for salt, pepper and cooking oil – EveryPlate is more stingy. They require you to use (and have!) your own butter, sugar, flour and ketchup, for example. As not everyone has a stocked pantry, make sure you read what each recipe calls for before ordering it. EveryPlate delivers their boxes (at least to my zipcode) on Wednesdays. I got a shipping notification on Tuesday. 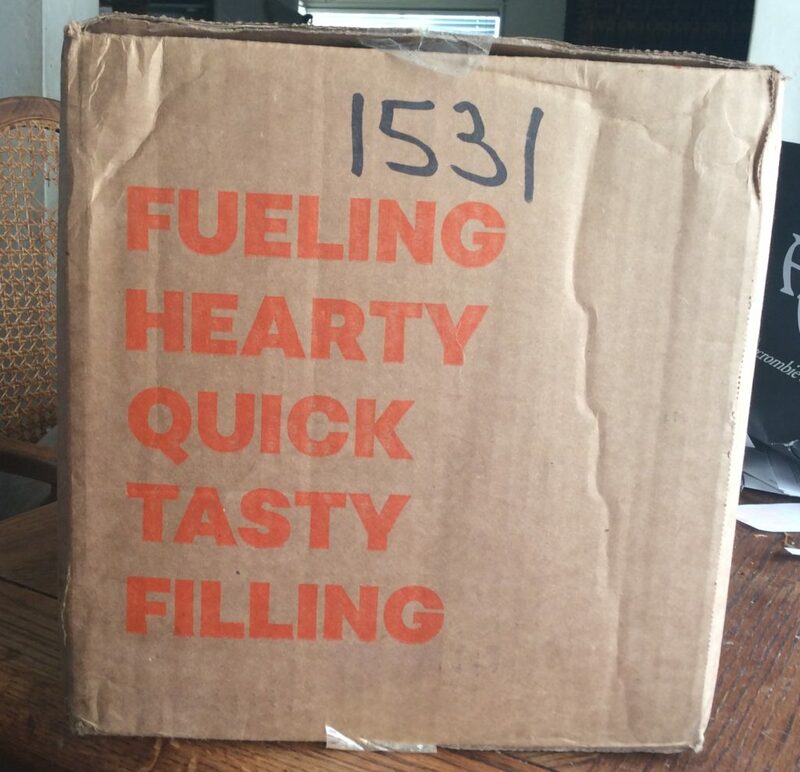 My box was delivered in the late morning, but it’s not guaranteed that it won’t be later in the day. For that reason, it’s probably not a good idea to plan to make one of their kits for dinner that night. The problem is that kits are usually most useful during weeknights – but if you use your first one on Thursday night, you’ll either have to make the last one during the weekend or leave it until Monday. The meats seem to be vacuum sealed so that I don’t think that would be a problem – but given how non-fresh some of the produce was, I wouldn’t have wanted to wait that long. 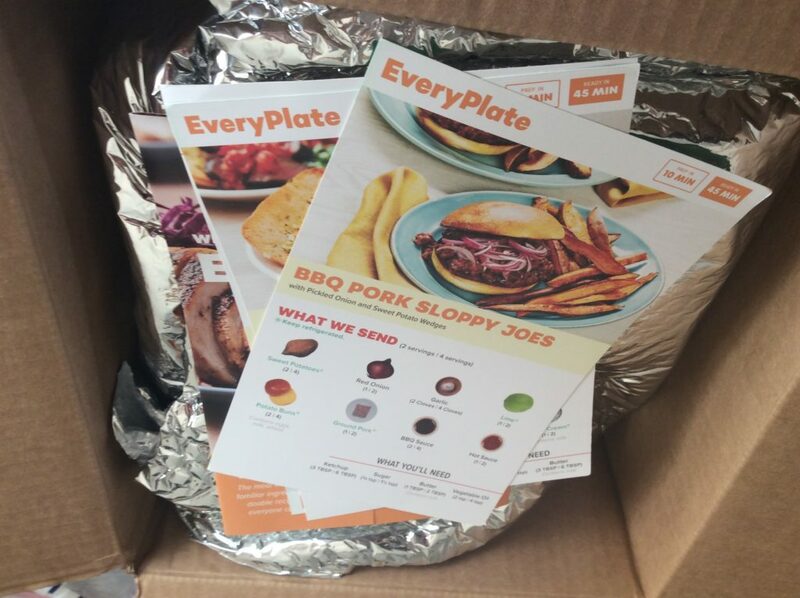 Like other meal kits, EveryPlate comes in a cardboard box. This one is on the small side and came more beaten up than others I’ve gotten. 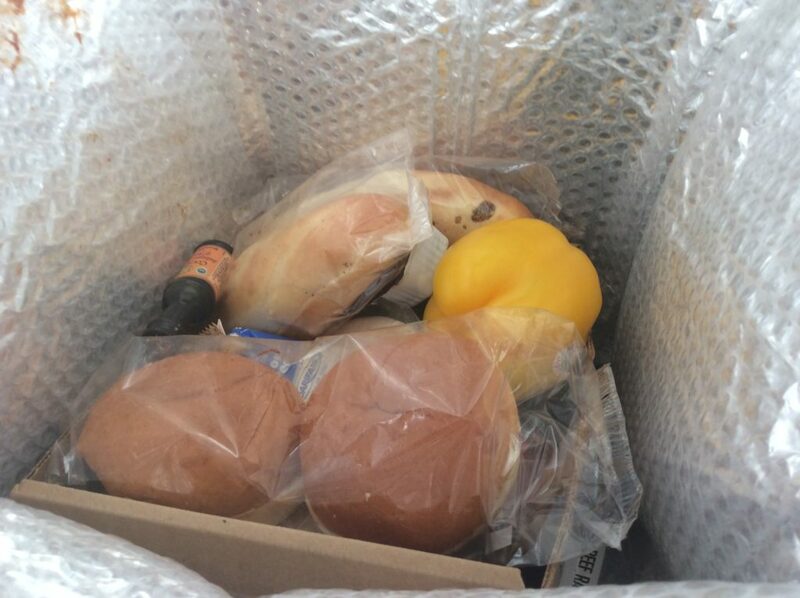 It also was carelessly sealed. The ingredients were all thrown together inside an insulated bag. Dried ingredients were in a box on top of a freezer pack, with items needing refrigeration underneath them. The carelessness in putting the materials in the box resulted in one of the BBQ packet arriving open. Unlike other kits, the ingredients didn’t come in individual bags for each recipe and they didn’t have stickers indicating to what recipe they belonged. Rather, they were all mixed in together. This turned out to not be an issue. As there were fewer ingredients that in other kits, I simply kept the dry ingredients in the box on my kitchen counter, and put the meats and sour cream (the only ingredients that needed refrigeration) in the fridge. As with most other meal kits (save for Sun Basket), the box can be recycled, but the liner and freezer packs cannot. A surprisingly enjoyable dish with good quality beef. All in all, I was happy with them. They were relatively easy to make, quicker than other meal kits, and they were tasty. The portions were also OK – though in some cases this was because of the empty carbs (just look at the size of that garlic bread in comparison to the beef!). A very decent meal to put together with stuff I had at home. Cancelling the service was also very easy – just do it online. A week after I cancelled, I got an offer to come back and get 6 free meals. Alas, I can’t find three meals that two of us would like in the upcoming menus. Tacos & fajitas seem to be one of the most common meals offered by meal kit companies. I’ve ordered them a few times, simply because I didn’t see anything else they offered that we might like, but it’s not a top choice for me. I can get three ready-made tacos of a similar size at the Mexican Restaurant in the corner for $13, and I don’t have to spend the time cooking them. Or, of course, I can make them myself for a few dollars. Still, some of the taco recipes I’ve made have been good and I’m always up for a discovery. This recipe for carne asada fajitas with pickled onions and lime cream, however, did not produce one. 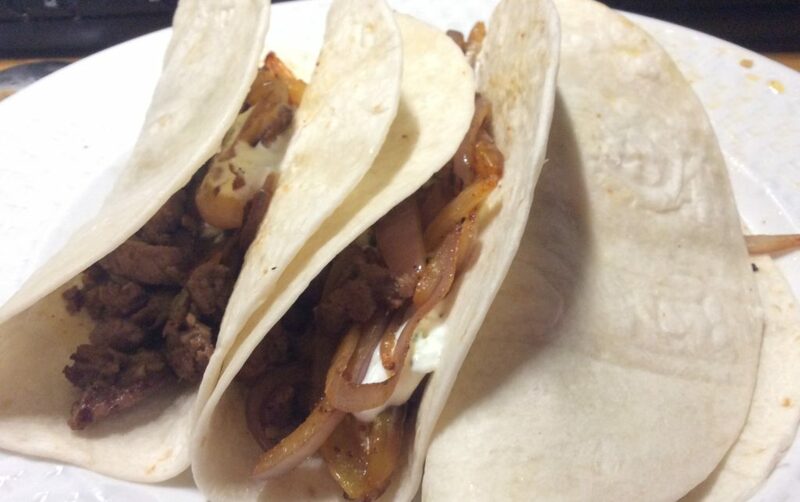 The tacos/fajitas were pretty straightforward and just OK flavor wise – indeed, they might have been better without the southwestern flavoring. 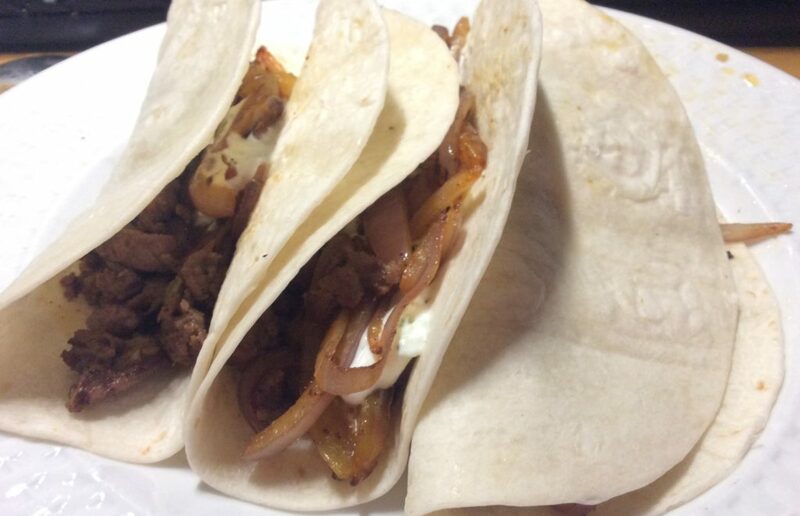 They were fairly easy and quick to make and at $13 for a meal for six tacos, they were pretty cheap. I got this kit for free, with a special one-time code that someone gave me. The regular cost for the two serving kit is $13, including shipping. Use this link to get $20 off your first box. I didnt manage to take my own photo when I made these. Sometimes a meal kit fails you, and sometimes you fail a meal kit. This time I think both of us failed each other. 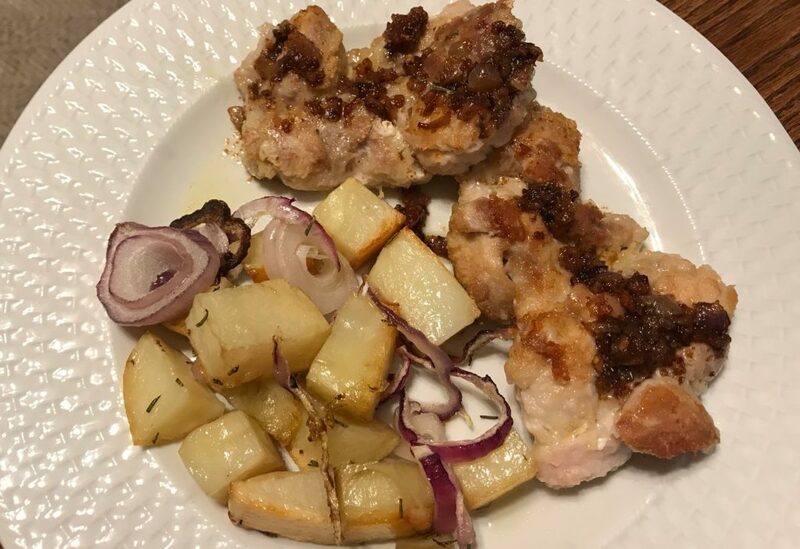 I think this could have been a pretty good meal kit if I’d had all of the ingredients, and if I had been more careful while putting it together. As things were, my husband got a decent sandwich – but not really a sloppy joe – and I got to eat the remaining filling with a spoon. At least it was pretty tasty. 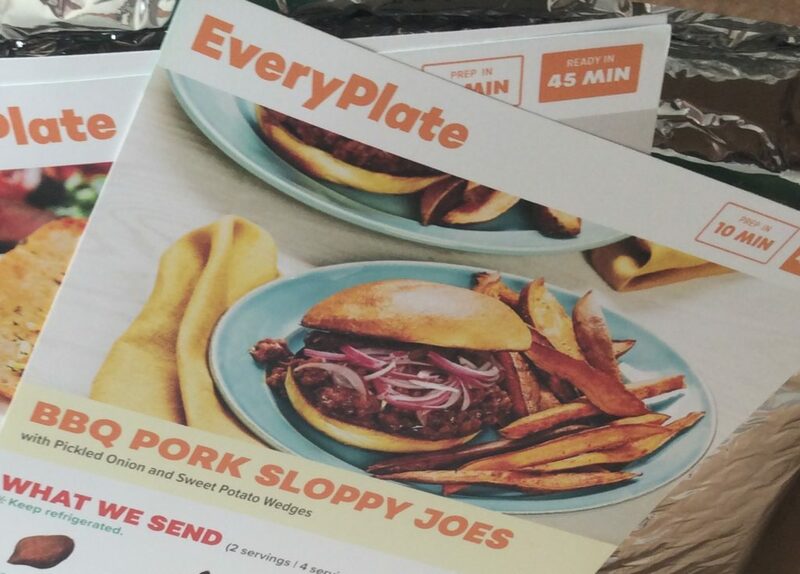 This EveryPlate kit consists of ground pork which is supposed to be cooked with BBQ sauce and ketchup, potato buns, an onion to quickly pickle and sweet potatoes to bake. One of the two packets of BBQ sauce my kit came with was open, so I had to toss it away. Unfortunately, when I went to make the pork, I realized I didn’t have any more BBQ sauce at home. Even worse, the kit called for using my own ketchup – and I was also out of it. At the end, I was only able to cook the ground pork in a the single packet of BBQ sauce. Amazingly, this still gave a very nice flavor to the pork. I didn’t try the pickled onions, but my husband raved about them. I’m thus including the recipe below. As for the buns, I burnt my first two when I put them in the toaster – and then dropped them (thus my lack of a sandwich myself). I also managed to burn the sweet potatoes. Indeed, one of the things that did not work with this kit is that the sweet potatoes require that you preheat the oven (something which takes at least 15-20 minutes) and then you cook them for 20-25 minutes. The rest of the meal takes a very short time to make. So we were ready to eat far before the sweet potatoes were ready – which is why I forgot about them. Combine all ingredients in a bowl. Let to pickle for at least 10 minutes. Heat oil in a large saute pan over medium-high heat. Add the onion, season with salt & pepper, and fry, stirring frequently, until soft – 4-5 minutes. Add the minced garlic and cook for 30 seconds. Add the ground pork and cook, stirring and separating, until browned, about 4-5 minutes. Add the bbq sauce, ketchup, water and lime juice. Cook, stirring frequently, until it thickens. Taste and adjust seasoning. Serve in burger buns topped with the pickled onions. 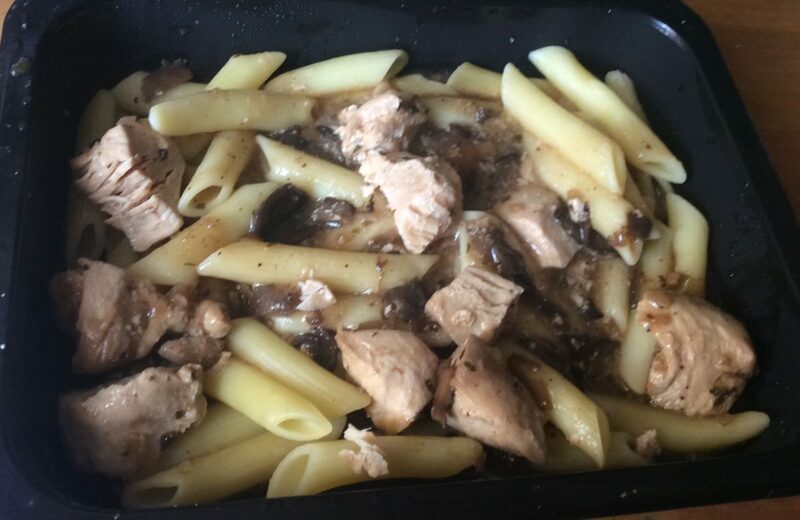 Last week I found this refrigerated tray meal for Chicken Marsala with Penne Pasta at Grocery Outlet, and decided to give it a try. I love chicken marsala. At $5 for what is really a portion for one person (unless you are eating something else), it’s not exactly cheap for a pre-made, refrigerated meal, specially when bought at a bargain store, but I figured it was worth a try. Unfortunately, that was all that it was worth. The chicken in the dish was incredibly dry. Now, this is very unusual for microwavable meals, but somehow Heat.Eat.Done managed it. The sauce also didn’t actually taste of Marsala wine – it lacked the sweetness of the wine -, and it was too liquidy and tasteless. I would not buy it again. The other night I decided to take Mike out to dinner. One of our daughters didn’t want to go out and the other one was out, so it seemed like a great opportunity for a date night – and for trying a new restaurant. After our first choice didn’t work out, we ended up at Xiang Yuan Xiao Long Bao – which occupies the space that Ming Tasty had for many years. It was an inspired choice, as neither of us had ever had Shanghainese food per se, and we love trying new things. Given the name of the restaurant, we of course had to try the Xiang Long Bao (also known as XLB) from the Dim Sum menu (which seems to be available at any time). We ordered both the pork ($7) and crab ($8.5) versions. Not having XLBs before, we were unprepared for what we got: a steamed dumpling filled with both meat and broth! To accomplish this, cooks add pork skin to a broth and allows the collagen from the skin to melt into the liquid. The pork skin and veggies are discarded, and the now collagen-rich broth is refrigerated and allowed to solidify. It’s then chopped and added to the dumplings along with the filling. Ingenious and delicious. I wasn’t sure how to eat the dumplings, so at first I broke them with my chopsticks and just ate each part separately. Later I adopted Mike’s method of just putting the whole thing inside my mouth (make sure they cool down before you do this). They were much better that way, as flavors and textures are allowed to combine in your mouth. Apparently, the proper way to eat them (or at least the way used by the restaurant reviewer at the East Bay Express) is to bite off the top, allow the broth to cool, and then to sip it, before eating the rest of the dumpling. I think I like Mike’s way better, though they are a little bit big (and I have a small mouth). We also ordered the green onion pancake ($4). This was very oily, and therefore pretty filling. It was a bit bland, but it was great with the broth from the dumplings. I’d order it again, but would want some sort of tasty sauce to go along with it. Finally, we had the pan friend pork buns ($8). These were unlike any pork buns I’ve had before. Instead of bbq pork, they had the same soupy filling as the dumplings, though with less liquid. Once I abandoned my expectations that they be sweet, I found them very good. They were also easier to eat, and I’d definitely order them again. The restaurant itself is in a good location in downtown San Leandro, but suffers from a very generic building. Still, it’s nicely decorated with photos of Shanghai at the turn of the 20th century – I was somewhat surprised of how western it looked. Service was competent and polite. All in all, I look forward to returning. Read the East Bay Express review for more suggestions on dishes to try.